After conducting due diligence on a potential investment’s rent growth potential, capital expenditure requirements and environmental characteristics, the Longwell Company identifies potential sources of financing and assesses such opportunity’s total cash flow and capital return profile. After acquiring a property, the Longwell Company applies its property management expertise by providing on-site management staff and implementing renovations and improvements that include, among other things, upgrades to unit interiors, the installation of washers and dryers in individual units and clubhouse improvements including fitness and business centers. The firm also focuses on making “green technology enhancements, such as the installation of dual-paned windows, low-flush toilets and additional insulation, that not only improve tenant accommodations but also enhance a complex’s environmental “footprint. These property management and renovation activities, together with marketing activities, generally permit the Longwell Company to raise rents and increase occupancy at a property shortly after its acquisition. The Longwell Company’s approach results in multi-family housing complexes the firm elieves to be comparable to newly-built, Class "A" complexes but that offer rents significantly lower than such complexes, thereby providing a good value to tenants. After acquiring, improving and managing a property for 3-5 years, the Longwell Company then seeks to dispose of the asset and has succeeded in disposing of such properties at valuations significantly in excess of its acquisition, financing and renovation costs, thereby generating an attractive combination of cash flows and returns on capital. 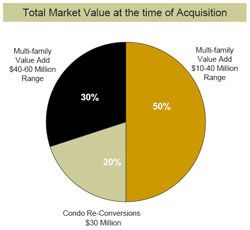 Given the recent turmoil in the U.S. real estate markets, the Longwell Company believes that current opportunities in the residential multi-family rental market in the Western United States favor the leverage levels, focus on cash flows and in-house renovation and property management expertise of the Longwell Company.